Remarketing is a way to re-engage a user who has visited your site. If you take a look at your site’s conversion rate, you might see something like 2 or 3% for an e-commerce site which is totally normal. However, that means that 97% or more of your visitors do not convert on your site! 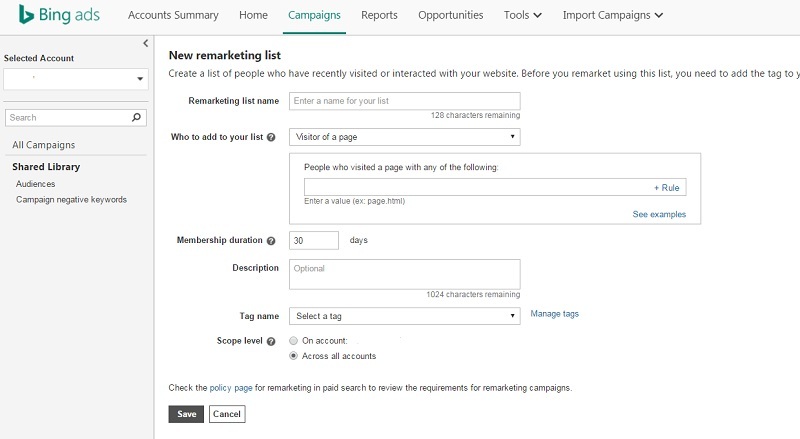 Here is the guide to get started with remarketing in Bing Ads and how to use it! First, you will need to have UET (Universal Event Tracking) set up with your account. This tag will allow you to track your entire website for multiple website activity events. This type of activity allows you to create multiple goals on your site and also audiences. Check out the official guide on how to set up UET here. With this step complete, we can get on with our audiences. You will need a minimum of a thousand visitors to be eligible. This is actually the same step as Google AdWords, so there won’t be any confusion on how to start this process if you use this already in Google. If you have created any remarketing lists before, you will see them below this tab. In fact, you will be able to see your list size grow as the days / weeks go by with more and more users being added to these lists that you create. Step 3. Define the list that you want to target. This step is completely up to you on what you want track within Bing Ads. By default, you will see visitors of a page as the list. However, you can create by custom events like if someone watched a video on your site. You can also add multiple URL’s here when you click on the +Rule tab. For example, you can say that they put something in the shopping cart, but the user never got to the thank you page. Also, the scope level is a good thing to check out. You can have this audience targeting follow just one particular account, or you can have it track across all accounts. For this example, I just have this follow on one account. One the audience has been created, you need to wait until you get 1,000 users to finally see some data. If you change any of the criteria points for the audience, you will have to restart and gather the data again for your lists. With the audiences created, we can now associate them to the ad groups that we want. 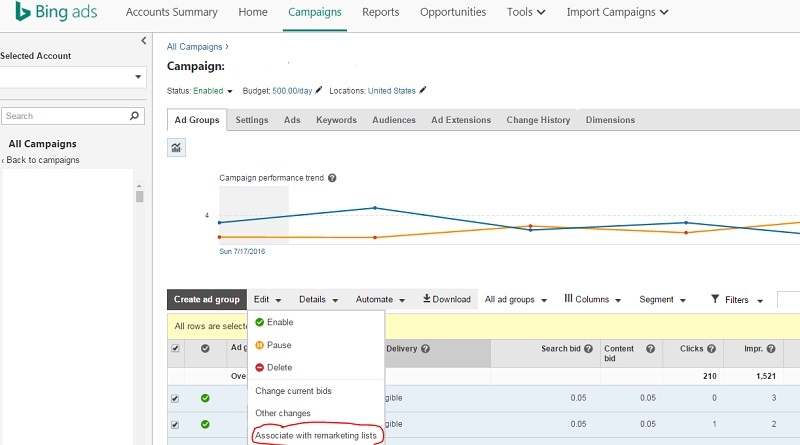 Bing has this set up at the ad group level, so we can click on the campaign that we want to associated with in the UI and have the ad groups section clicked on. From there, select all the ad groups you want to select and click edit–> associate with remarketing lists. From here, you can select all the remarketing lists and choose either bid only or target and bid only. Bid only shows ads to people searching for my ad, with the option to make bid adjustments to selected audiences. Target and bid shows ads only to the selected audience, with the option to make bid adjustments. 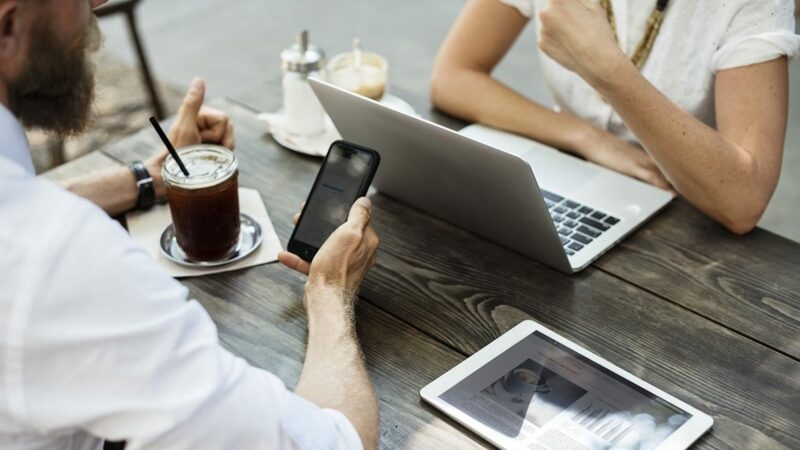 Target and bid can work great if you have a Non Brand campaign and want to only target people who have gotten close to purchasing your product, but left the item in the shopping cart. With the bid and target set, you can bid more aggressive on broader terms that you normally would not of gone for in the hope that they are more qualified than a normal searcher searching for that term. You can do this either in the UI, or you can pull a report in the report’s section called Audiences. From the UI, we need to look for the audiences tab. From here, you can change the columns to view any metrics that you want. The report’s section is good if you need to add multiple dimensions to the report like network, device type, and more. Here are some things to remember when it comes to audience targeting. First, you need to have UET tracking implemented. Second, you might have to wait a day (or longer) to get the 1,000 users you will need to get going. After those two criteria points are met, you can get going. When it comes to remarketing, you can really get as granular as you want. For example, your audience that says someone visited your site in the last 30 days to someone visited the sales page, put something in the cart, but did not actually convert. The more constraints you put on the list, the more specific and qualified the user is for remarketing, but you are also closing up the funnel to users who did not meet that need. My suggestion is to have more than one audience created that covers the broad audience all the way down to that user who is likely to convert. You can also add things like bid multipliers to your audiences based on the criteria points with your audiences. For example, 100% bid higher for homepage, 200% for product pages, 300% for cart abandons, etc. All in all, you need to pull weekly reports to see how your audiences are trending and look for KPI’s like ROAS, CPC, CPA, Conversions, and more to see what is next. You can even take it one step further and create a non brand campaign on very broad terms that you normally would never bid on (like the term golf), and only show for that term if someone met many different criteria points by visiting your site. My last point I want to make is to make remarketing non creepy! Here is a great post from Purna from Bing Ads about more tips with remarketing.